A century-old Jesus fresco, entitled “Ecce Homo,” was defiled in a Roman Catholic church in Borja, Spain this past week. The person responsible for such sacrilege? Eighty year-old Cecilia Giménez. According to the New York Times, “the authorities in Borja said they had suspected vandalism at first, but then determined that the shocking alterations had been made by an elderly parishioner. The authorities said she had acted on her own.” Giménez claimed that she attempted to restore the work–her favorite fresco–because she was upset that its paint was peeling. 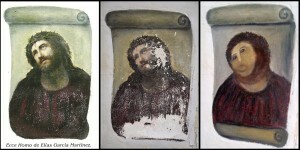 While Giménez confessed to ‘restoring’ the fresco on national television, she also defended herself, arguing that she, “had worked in broad daylight and had tried to salvage the fresco with the approval of the local clergy.” The once-marvelous fresco of Jesus with his crown of thorns now takes on a somewhat ape-like appearance, and has since become an Internet meme. Authorities are now attempting to re-restore the fresco with the help of art historians.